Grinding Gear Games announced a new expansion called Path of Exile: Delve, due for release on August 31st for PC and shortly after that, on September 3rd, for Xbox One. This new expansion is also set to introduce the first ‘infinite’ dungeon, the Azurite Mine, which will be a far greater challenge than even the current endgame maps. Competitive players will be able to check a ladder and see who was able to venture further into the dungeon’s endless depths. 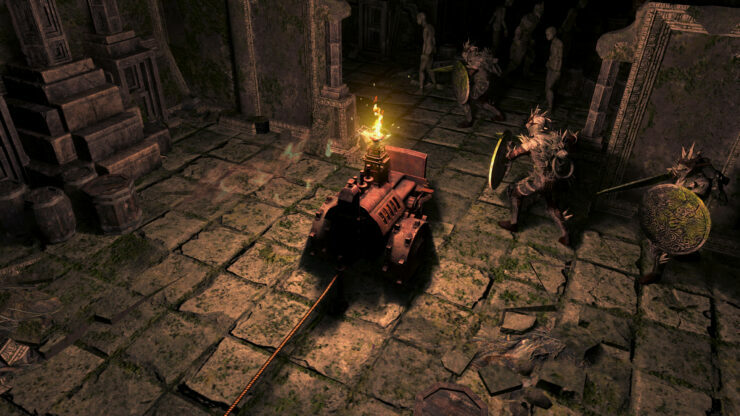 Path of Exile remains a free-to-play game, so you can always try it out if you haven’t already. As a side note, Chinese giant Tencent acquired a majority stake in Grinding Gear Games just a couple months ago. In Path of Exile: Delve, you will delve into the Azurite Mine’s infinite depths to extract treasure and discover its subterranean secrets.Our latest expansion features an infinite dungeon and socketable currency items, as well as a bunch of new unique items, skill gems, balance changes, graphics engine improvements and more! Left untouched for over 250 years, the Azurite Mine has been consumed by a malevolent darkness that cast out the Eternal Empire. Niko, an inventor, has harnessed the power of Voltaxic Sulphite to create a machine called the Crawler that can pierce the darkness. Delve into the mine but don’t leave the Crawler’s light for long or you’ll be crushed by the darkness. The Azurite Mine is full of treasures for those brave enough to risk the darkness for short periods of time. Use flares to venture farther away from the Crawler’s path, and dynamite to destroy unstable walls which conceal even greater rewards.The Azurite Mine is full of treasures for those brave enough to risk the darkness for short periods of time. Use flares to venture farther away from the Crawler’s path, and dynamite to destroy unstable walls which conceal even greater rewards. Deep in the Azurite Mine, you’ll discover many different biomes. As you delve even deeper, you may encounter lost cities from Wraeclast’s dark history. Each environment has its own monsters, bosses, encounters and rewards. The ancient civilizations created special crafting items that can be socketed with fossils to modify their behavior. The Azurite Mine is Path of Exile’s first infinite dungeon. The deeper you delve, the harder the game gets. In Delve, you’ll find encounters that are much harder than end-game Maps. Your progress is only limited by the power of your character build. The Depth Ladder tracks who has delved the deepest into the mine. Path of Exile: Delve includes ten powerful new or completely reworked skills, centered around two character archetypes: the Guardian and the Pathfinder. Play as a holy warrior who strikes down foes with lightning damage while benefiting teammates and minions, or as a chaotic archer who uses nature- and poison-based skills to pin and suffocate enemies. A Path of Exile expansion is not complete without powerful new items to discover! Delve includes 7 new Divination Cards and 18 new Unique Items which have a focus on creating powerful new build opportunities. In your travels across Wraeclast, you may very rarely discover a Timeworn Reliquary Key. This key will open a portal to the Timeworn Reliquary which contains one of 150 Unique Relics from past Path of Exile leagues.